Heartworm disease is a mosquito transmitted disease that affects thousands of dogs each year. Heartworm disease in dogs is quite common in most Australian states but the further north you travel the more prevalent the disease becomes. 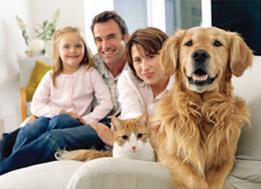 It is usual for dogs not on heartworm preventative treatments to become infected by heartworm during their life span. After injection by a mosquito, adult worms eventually start to grow inside a dogs heart and lungs, causing very serious damage. Due to their large size they become a major barrier to the free passage of blood through the heart and eventually this causes the heart to enlarge and weaken. Monthly heartworm medications are very popular and come in the form of either tablets (chewable or regular) or a spot on preparation that is absorbed through the skin. Some monthly heartworm medications will include other active ingredients that also control worms and fleas. All monthly preparations are 100% effective providing the correct dose is given for the dogs’ weight and that it is given monthly without missing any treatments for the dogs entire life. Remember there can be mosquitos all year round. Dogs currently on monthly medications can be easily changed to yearly heartworm injections.